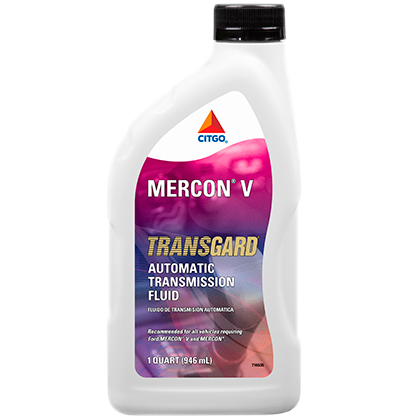 CITGO TRANSGARD ATF, MERCON®-V is an advanced extended life automatic transmission fluid designed for Ford transmissions and transaxles. This product may also be used in automatic transmission units that require a fluid qualified against the Ford MERCON® specification. Recommended for use in all applications requiring MERCON®-V, MERCON®, DEXRON®, ALLISON C-4 and JASO 1A. It is also formulated for use in most Toyota, Nissan, Honda and other imported vehicles. This product is an excellent choice for transmissions used in severe service, including passenger car and bus fleets as well as towing applications, and is designed to exhibit extended life compared with conventional multipurpose ATFs.